I've been looking forever for just that perfect basic chocolate chip cookie recipe. I've tried a bunch--some too much butter, some too cakey, some not enough chocolate chips. My husband found this one on allrecipes and it's been a winner ever since! 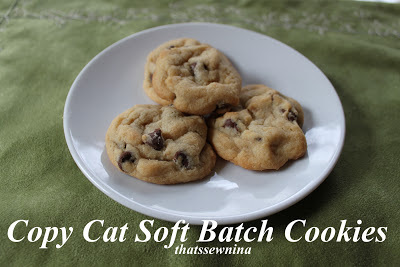 My husband is a Keebler Soft Batch addict! I've never been able to get over the chemical taste so I'm not a fan but I love that these cookies come out perfect every time and taste just like how "soft batch" cookies should be. Soft but not in an underbaked way. Check 'em out! Cream together the butter, white sugar, and brown sugar until smooth. Beat in the eggs one at a time. Stir in the vanilla. Dissolve baking soda in hot water. Add to batter along with the salt. Stir in flour. Finally mix in the chocolate chips. I like to make these kinda small so I use just about a tablespoon of batter, roll into a ball and drop onto a parchment paper covered cookie sheet. Bake for exactly 10 minutes in a preheated oven. The edges and top should be just getting a little golden.